U.S. Forest Service firefighter Sergio Toscano's home was destroyed in the Sand Fire in Santa Clarita. SANTA CLARITA, California -- A firefighter with the U.S. Forest Service learned his home was burned to the ground by the Sand Fire while he was battling a blaze at Camp Pendleton. Sergio Toscano was sent to Camp Pendleton in San Diego County to battle the Roblar Fire, which broke out Thursday evening. While Toscano was battling the Roblar Fire, he received word that the Sand Fire was nearing his home on Little Tujunga Canyon Road in Santa Clarita. 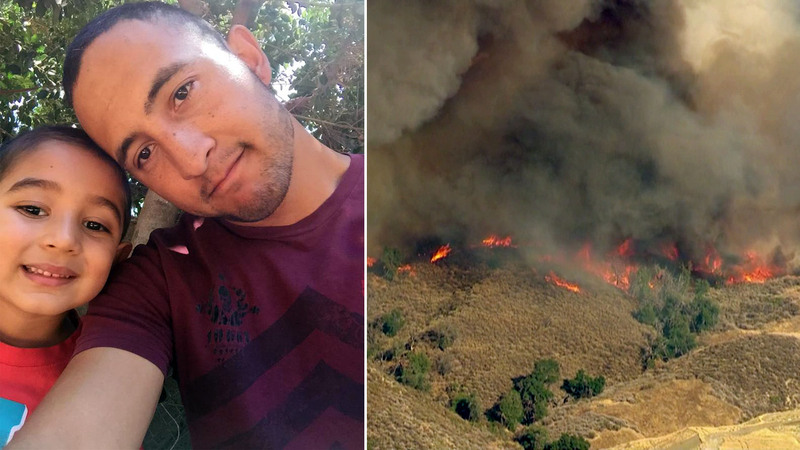 "We were assigned to a fire at Camp Pendleton, the Roblar Fire, I was getting text and phone calls from back home updating me on the fire that was going on back home," Toscano told ABC7. After learning his home had been destroyed, Toscano was pulled from the Roblar Fire and assigned the Sand Fire. "We eventually got removed from that fire (the Roblar Fire) and now we're back here fighting this fire (the Sand Fire)," Toscano explained. "I'm still at work and trying to get a hold of this fire (the Sand Fire), trying to protect the other structures that are around the area." Toscano, a Marine veteran, has been a firefighter with the U.S. Forest Service for four years. He has a young son who was with his mother at the time of the Sand Fire. Friends and family of Toscano started a GoFundMe account to help him recuperate his losses. Toscano learned that two other U.S. Forest Service firefighters lost their homes to the Sand Fire blaze as well, and said he would split the donations from the GoFundMe account with them.